Modernist Jewelry - This is a beautiful statement sterling silver pin and pendant combination that features a large Lab created purple oval Alexandrite gemstone (25mm x 18mm). 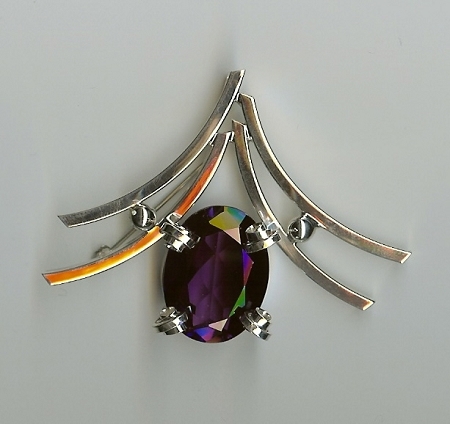 Wear this flashy high polished art jewelry piece as a pin or with a chain. Handmade sterling silver pin / slide with a faceted lab created oval alexandrite. This is a versatile piece as it can be either worn as a pin or on a chain as a necklace. This design is also available in Smoky Topaz, Red Coral, Amber, and others. Please call for more information. A classic and fun design handmade and signed by Aaron Rubinstein.